Railpictures.ca - Bill Thomson Photo: OLOR GP9 179 “Griffin” is shown with sister unit 180 “Champlain” at Vankleek Hill on May 22nd, 2000. OLOR is the Ontario L’Orignal Railway that was operated by RailTex/RailAmerica, and L’Orignal (note the spelling, not L’Original) is on the Ottawa River 88kms east of Ottawa. The line was acquired by Quebec Railway Corp in 2000. Both 179 and 180 were ex-Cartier GP9′s that came to OLOR via the GEXR in the 1990′s, and later made their way to the Michigan Shore Railway (where both ran until eventually being sold for scrap). | Railpictures.ca – Canadian Railway Photography – photographie ferroviaire Canadienne. Caption: OLOR GP9 179 "Griffin" is shown with sister unit 180 "Champlain" at Vankleek Hill on May 22nd, 2000. OLOR is the Ontario L'Orignal Railway that was operated by RailTex/RailAmerica, and L'Orignal (note the spelling, not L'Original) is on the Ottawa River 88kms east of Ottawa. The line was acquired by Quebec Railway Corp in 2000. 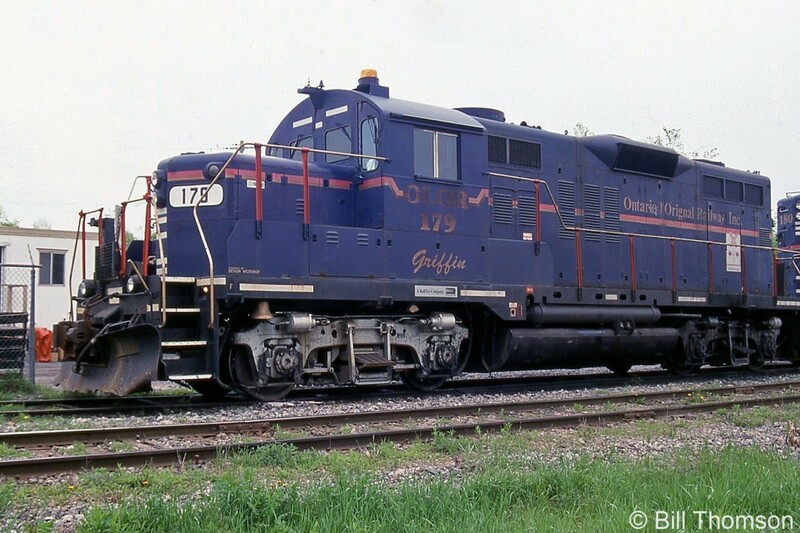 Both 179 and 180 were ex-Cartier GP9's that came to OLOR via the GEXR in the 1990's, and later made their way to the Michigan Shore Railway (where both ran until eventually being sold for scrap). I managed to shoot this in 1999. OLOR didn’t didn’t last too long before OCRR acquired it. They were kind of a back-woods operation. Nice paint scheme though. Thanks for sharing Bill.